For the past several years, my wonderful and amazing parents, Tony and Linda have been living a Ketogenic lifestyle. They have tried teaching me the importance of feeding my body good fats, but much like the rest of America I have always been programmed to count my calories, eat low fat foods, and consume a balanced diet of protein, grains/carbs, dairy and fruits & veggies. Recently I noticed the keto diet began to make quite a buzz and several people I know started losing weight eating the way my parents have been preaching about for years. 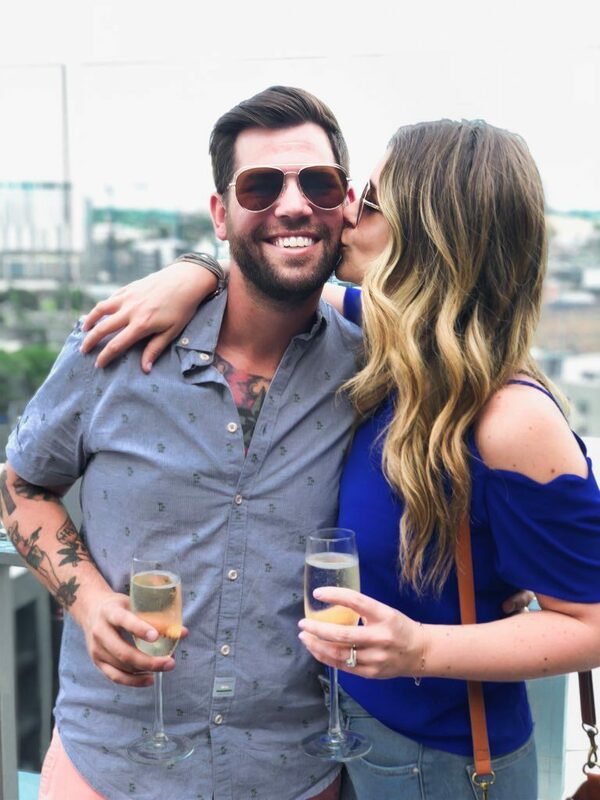 Two weeks ago, Jordan and I decided to give it a try. We are going to Mexico in the beginning of July and figured this was the perfect time to shed a few pounds! In two short weeks, I lost six pounds and Jordan lost FOURTEEN! I’m going to share with you what we’ve done from day one and why we will NEVER eat any other way ever again. 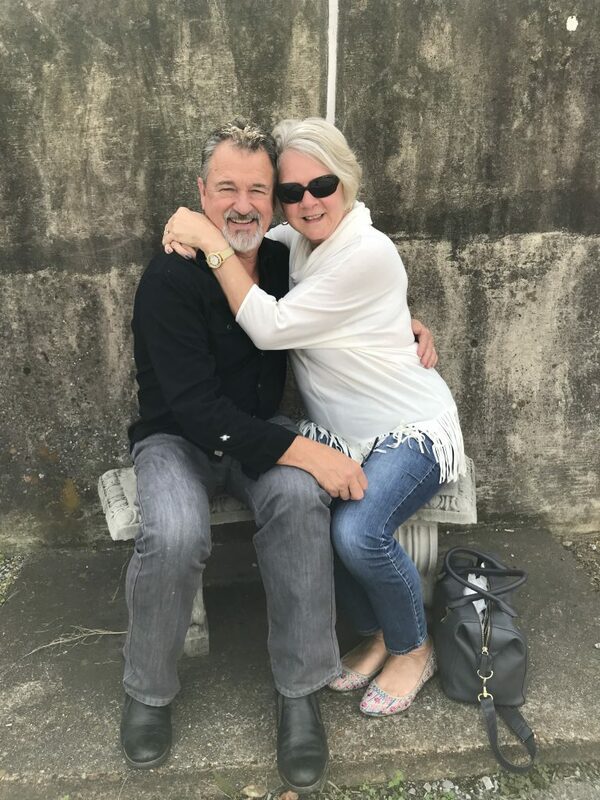 Tony and Linda… our official Keto coaches. To know them is to love them! Let me begin by telling you that even if we hadn’t lost weight on this diet, we would still eat this way strictly because of the unbelievable amount of energy we have acquired. From the moment I wake up at 6am (without even setting an alarm) to the minute I lay down (usually between 10 and 11pm) I have more energy than I ever have in my entire life. I’ve always been self-diagnosed with ADD and am someone who loves taking naps, but let me tell you what- my ability to focus and pay attention has greatly increased and I have too much energy to ever feel the need to take a nap since starting this meal plan. It’s truly unbelievable. Jordan just spent a week working 12 hour days in the hot sun and never got exhausted. He’s just as amazed as I am. Two successful weeks of keto calls for a little champagne! So what exactly is a Ketogenic diet? The meal plan we try to follow consists of 70% good fats, 25% protein and 5% carbs. Let me break it down for you as simply as I can. Your body is automatically programmed to produce energy from carbohydrates and sugar, but when you deprive yourself of those, you shift into ketosis, meaning your body is using the good fats you’re consuming and your stored fat to produce energy. You begin burning fat, feeling energetic, and voila… losing weight. Now, there are a lot of important factors that go into getting your body into ketosis. It’s not easy to stay there, so you literally cannot cheat on this diet or your body will shift back to using the carbs and sugar for energy and you will no longer be burning fat, just consuming it. And no one wants that. You can’t just start eating fats and expect to drop a bunch of weight right away. You have to clear the stored glucose out of your body before it will start using the fat for energy instead. We started out doing a four day bone broth fast in order to get our bodies into ketosis faster. I honestly had little faith in myself because I just love food and have quite an appetite, but it felt great to accomplish this and I felt so amazing by day four that it was totally worth it! If I can do it, so can you. 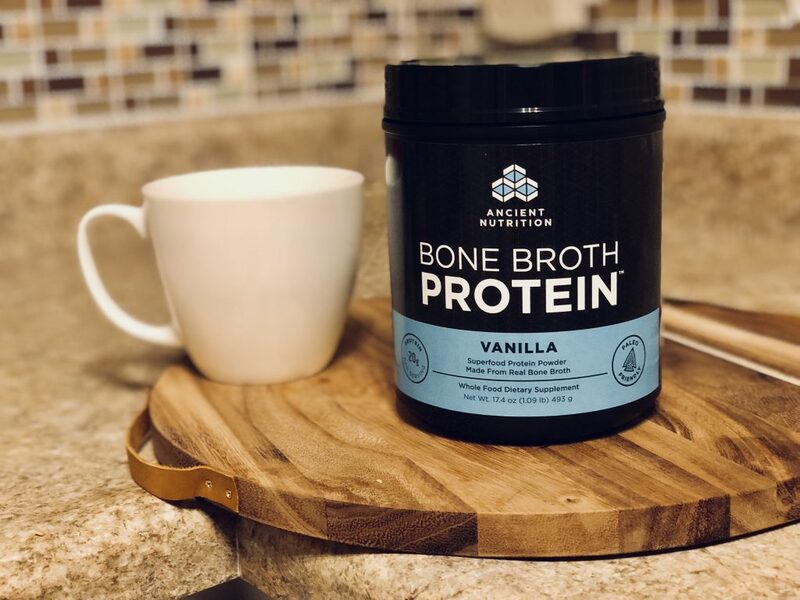 We used the vanilla flavored Ancient Nutrition Bone Broth Protein powder. (My parents say the Banana Creme flavor is even better.) You add ten ounces of hot water to one scoop of it and drink that three times per day (once for each meal). Obviously you can consume endless amounts of water as well, but that’s it. Bone broth and water for 4 days. (I would also drink a La Croix or two per day!) Keep in mind it’s not good to workout during this time since you are consuming so few calories. The bone broth fast is sooo good for your gut health, clears out the stored glucose and bad bacteria, and gets your body ready to kick into ketosis. The first three days were a little rough, but like I said, I felt so great on day four and was so proud of us for accomplishing it. Just pretend it’s a vanilla latte. That’s what I did! ha. Get your bone broth here. All the necessities to add to coffee! 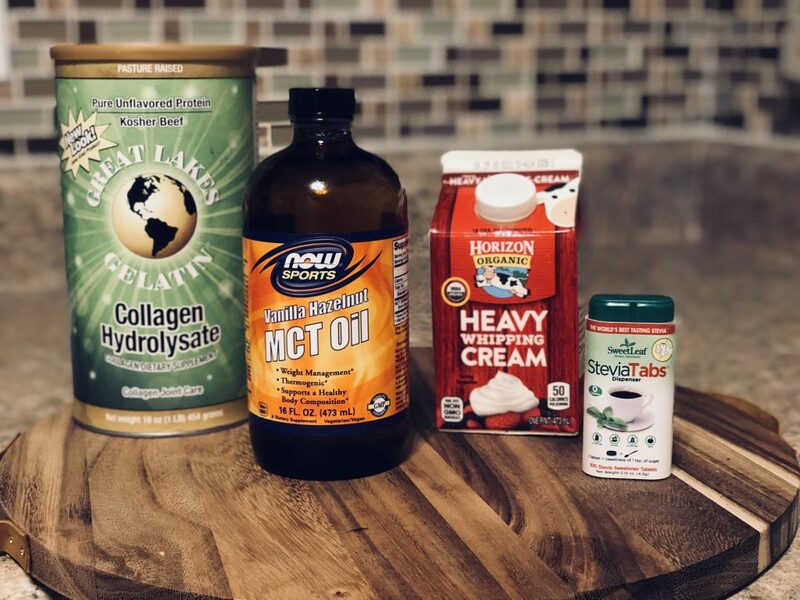 Collagen Hydrolysate, MCT Oil, Organic Heavy Whipping Cream, and Sweet Leaf Stevia Tabs. 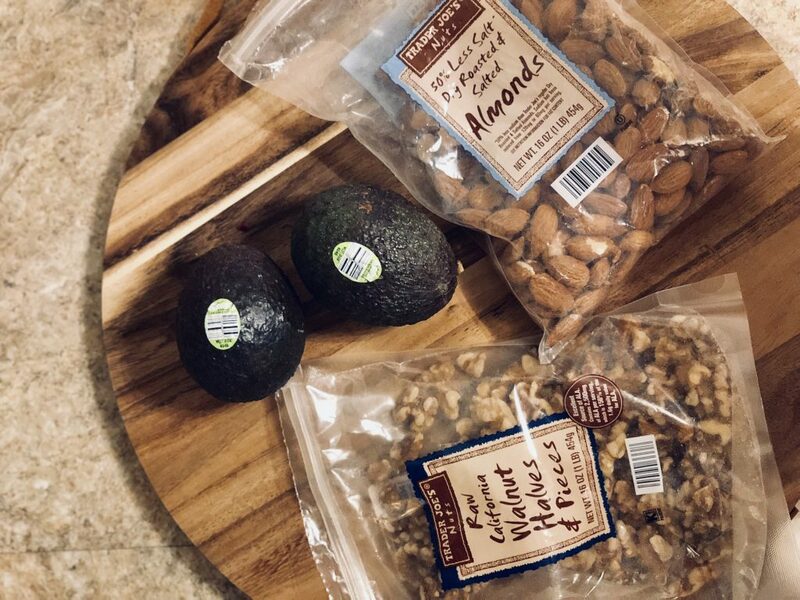 Snacking on almonds and adding avocado to a salad or scrambled eggs are two great ways to increase your good fat intake on the keto diet! As far as our lunch and dinners go, we typically eat a protein and a veggie, cooked in olive oil, coconut oil, or the ghee butter. You can definitely eat some good cheeses (although you don’t want to overdo the dairy) so we’ve made a cheese and charcuterie board for dinner, sans the crackers. You can eat a delicious salad and add protein to it, or make all different types of zucchini noodle pasta. Pinterest is full of great keto recipes! We’ve pretty much cut out alcohol, but there have been a few days I’ve had a drink or two. The best thing you can drink is vodka, gin or tequila, mixed with club soda. White wine has less carbs than red, so I’ve had a couple glasses of bubbly because I mean, it’s my favorite thing ever. I’m also someone who was scared of using too much salt because I easily get puffy. One margarita and my wedding ring is sooo tight. But the reason that happened is because I wasn’t consuming good salt. Your body needs a certain amount of sodium to not get puffy and stay hydrated (who knew?!) and as long as you’re eating the right kind of salt, you are good to go. I’ve also never been one to ever add butter to anything because you know, calories! 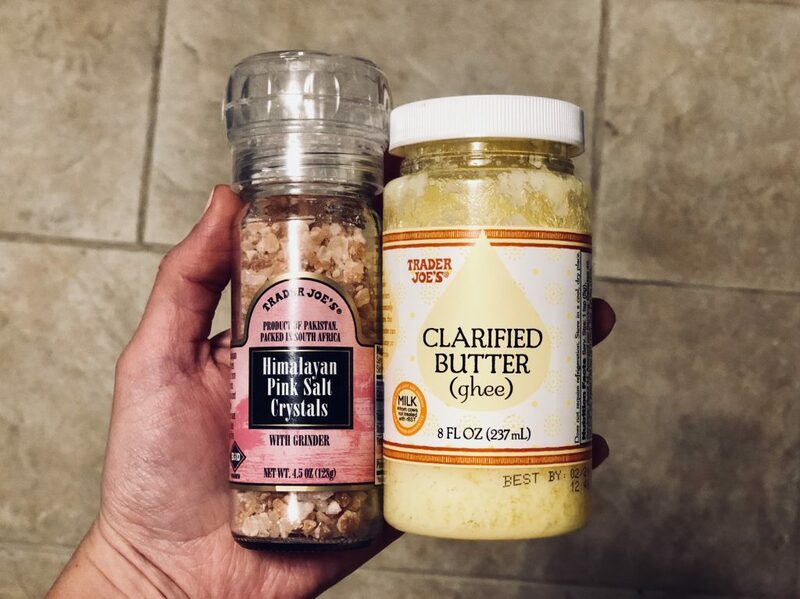 But we have started using clarified butter (aka ghee) which is the perfect replacement for your everyday processed butter. There are a few ways you can test your ketone levels so you know if your body is actually in ketosis. 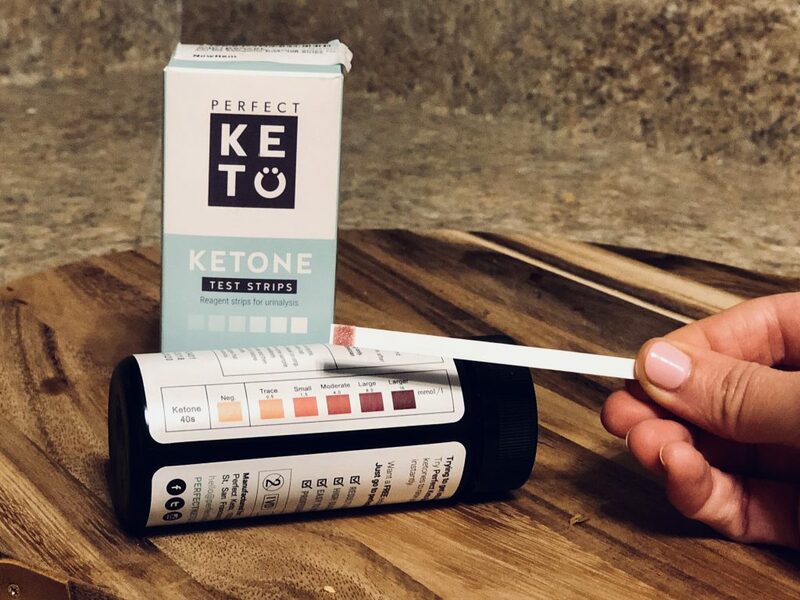 The easiest way (although my dad says it’s not 100% accurate) is by purchasing the Ketone Test Strips, which is a little strip you pee on and the color changes to let you know the ketone level in your body. I just did it today and you can see my results below. It looks like my ketone level is right around moderate, which is a pretty good place to be! You don’t want too many or too little. I think I’m doing pretty darn good! Purchase Ketone Test Strips here. Switching to pretty much all whole and organic foods is a big deal when it comes to Keto. We are trying our best not to consume processed foods, which are harder to digest and just not good for you due to all the chemicals and crap they are loaded with. We’ve started shopping pretty much only at Trader Joe’s or Whole Foods and although it might be a little more expensive than Kroger, we are eating so much less food and still getting full, so I honestly don’t think we’re spending that much more on groceries, yet we are feeding our bodies exactly what it needs/wants. And in return, we feel absolutely incredible, along with losing some unneeded pounds! I’m sure your Mom & Dad loved your write up as I did. Deidre! My roommates and I have been doing the diet for a little over a week. We had a cheat meal yesterday and I’ve literally been in a haze all morning. I have already seen results. No weight loss but my clothes fit better and it’s only been a week. Thanks for sharing! Thank you for sharing! This is so helpful & inspiring! I’ve been seeing/hearing a lot about Keto meal plans. Your firsthand experience & success has me excited to give it a try! Yess girl you should give it a try!! Thanks for sharing!! What’s been your favorite home-cooked Keto meal so far?! I looove Jordan’s brussel sprouts and he switched up his recipe once we started keto. So one night we had burgers with cheese and a fried egg (obvi no bun!) and bacon parmesan brussels. Soo yum! Thanks for the breakdown!! This sounds amazing and I think i just might try it. I’ve gained over 20 lbs!! Nothing is working and it’s soo frustrating. I need to try Jordan’s brussel sprouts!!! Btw… Your parents look AMAZING!!!! Aren’t they the cutest?!!!! Let me know if you need help with anything! You will love it!! Love this and so glad you guys are feeling wonderful!!! Yay and thanks for all your tips!!!! !